*I Photoshopped that candle flame in– how fake does that look?? Every year around the start of August, I ask R to think about what kind of cake he’d like me to make for his birthday. I’ve done Boston Cream a couple of times, Black Forest, and once even a chocolate cream pie. 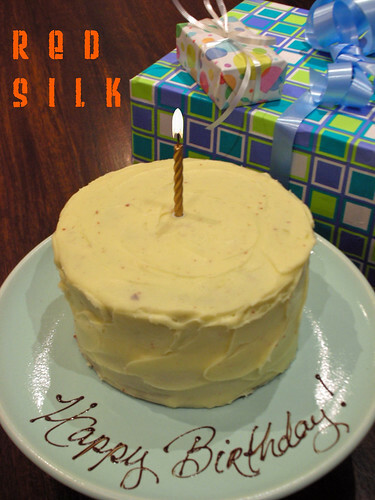 This year he asked for a “red silk cake.” Hmmm…I wasn’t sure what that was, but I thought I should know, so I said no problem. I would figure it out. I couldn’t figure it out. So the next day I broke down and asked for clarification. What he described was just a red velvet cake. Can’t blame the guy for confusing his fabrics, but now I can’t stop calling it “red silk,” and as it sounds sort of exotic, it must be said in a sultry whisper. I’ve never actually had red silk…umm, velvet…cake myself. One time, years back, I saw Martha Stewart and a guest make it on her old show. I saw them put two bottles of McCormick red food coloring into the batter! Horrifying– I mean, remember when they thought red M&Ms would kill you? I remembered seeing that the Daring Bakers had risen to the red velvet challenge back in March. That was before my time in the group, but I looked back over many of the posts to see their individual experiences and to know what to expect. Most thought a cream cheese frosting was traditional and that the chocolate flavor of the cake was very subtle. There were a lot of different recipes out there, but I wound up going with one in a book I have at home. I’ve had the Chocolate Bar cookbook for sometime, without ever having baked from it. Now was as good a time as any to try it out. The book was written by Matt Lewis and Alison Nelson, and I chose this recipe because Mr. Lewis is now a co-owner of Baked in Red Hook, a favorite sweet spot when I lived in Brooklyn. The cake and frosting recipes below are for an 8-inch three layer cake, but I halved the recipes below to make a six-inch two layer one instead. Also, I only have gel food coloring, so I just used a little squirt (in case you wonder why it’s not super duper red) and added a spoonful of extra boiling water to make up for the missing liquid. Although in the book, the authors recommend a vanilla buttercream (at Baked they use a cinnamon buttercream and decorate with red hots), I decided to go the cream cheese frosting route instead. I found this to be a tricky cake to ice– even with a crumb coat, there were little flecks of red all over the place. Oh well…one of the charms of homemade, I guess. R thought it looked and tasted great, and since it was his birthday, that’s all that matters to me. -Preheat oven to 350°F/180°C. Grease and flour three 8-inch round cake pans lined with parchment circles. -In a small bowl, whisk together the cocoa powder, food coloring and 2 T boiling water. Set mixture aside to cool. -In the bowl of standing mixer, cream together butter and shortening on high speed until light. Add sugar and continue beating until pale and fluffy, about 5 minutes. Add eggs and egg yolk, one at a time, beating thoroughly after each. -Mix buttermilk and vanilla into cooled cocoa mixture. -Sift together flour and salt. With the mixer on low, alternatley add flour and cocoa mixtures, beginning and ending with flour mixture. Mix until just incorporated. -In a cup, dissolve the baking soda in the vinegar (it will be fizzy). Add immediately to batter and mix until just combined. -Divide the batter between the prepared cake pans. Bake until a cake tester inserted into the center of the cake comes out clean or with a few moist crumbs, about 30 minutes. -Cool cakes on a rack in their pans for 10 minutes. Then turn out and let them finish cooling completely on the rack. When cool, frost with cream cheese frosting, below. -In the bowl of an electric mixer, slowly paddle the cream cheese, butter and vanilla bean paste. Add the powdered sugar and mix until just smooth, scraping sides of bowl as necessary. If too soft to spread, add more powdered sugar until it reaches desired consistency. All I can say that this cake is wonderful! Well-done! What a gorgeous cake. Lucky R.
I love your candle flame. No matter how fake it looks, it is still better than I could do. It looks fab! This is one of my favorite cakes! Gorgeous cake!! And I don’t think you needed any extra red – it is already quite red! Hey, the candle only looks fake because you pointed it out at first and only at the top, not the bottom. Anh, Mari and Deborah- Thanks! I am a red velvet fan now! My hubby’s all time favorite. I love how smooth the icing is, you are so talented! Hi! I’ve never commented here before but I’ve come out of hiding to ask if you mind me linking to you on my own (shiny new) food blog? I’ve just been setting it up and I thought I’d better check. peabody–It’s a good favorite! I look forward to making it again myself. Patricia–Thanks, but you have no idea how much I futz around with icing cakes. I can’t leave well enough alone. Andrea–Thanks! I’d like to try the bagels sometime. 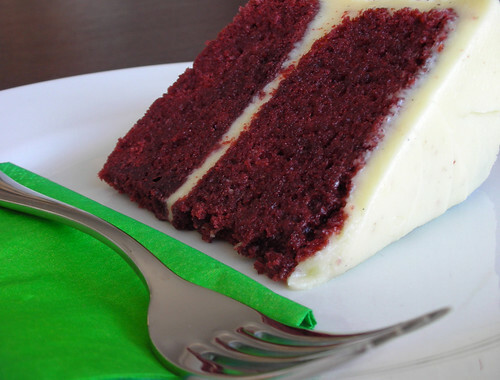 It’s hard to beat cream cheese icing on a red velvet cake! Just wanted to say thanks for the recipe! I made cupcakes instead of a cake, and the recipe as given yielded about 24. They took a little less time (about 23 minutes). The reviews were all highly positive, especially for the frosting! Thanks for the feedback, Matt! Glad you liked the recipe!